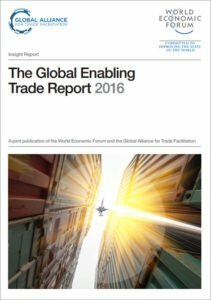 This bi-annual report, published by the World Economic Forum and the Global Alliance for Trade Facilitation, is a benchmark for governments looking to boost growth and development through trade. It captures data on the efficiency, transparency and expense associated with importing and exporting goods. The 2016 report finds that governments are making slow progress in improving customs and borders procedures, with many small businesses and entrepreneurs cut off from the global trading system as a result. In fact, the performance gap on border administration between high and low-income economies has widened slightly in the past two years. Reforming border administration remains a largely untapped tool with high potential to drive inclusive growth. The biggest beneficiaries of reforms would be small and medium-sized enterprises (SMEs) which typically lack the resources to comply with complex, expensive or time-consuming measures. The report finds that countries’ performance on border administration is strongly correlated with the level of development but there are several bright exceptions in Sub-Saharan Africa, with landlocked countries such as Botswana and Rwanda jumping ahead of South Africa in their regional rankings. In contrast, most commodity-rich countries underperformed their income group in border administration.